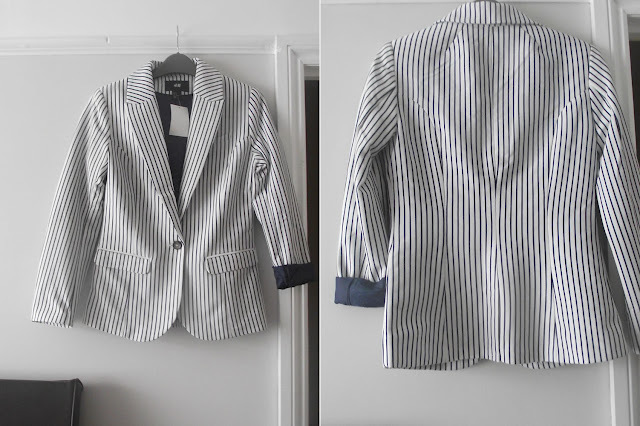 As promised I have my H&M haul to share with you all. This arrived last Thursday and I'm really happy with everything I ordered. They did make a slight boo boo with one item. I ordered a denim dress but instead they sent navy trousers. But after a fairly quick phone call all was sorted. Sorry for the grainy photo, I didn't like the flash version! I've been eyeing up this grey marl blazer for a while now, I like how casual it feels but yet it still looks smart. So when I saw it had been put into the sale I clicked like mad to check for my size. I did order size 10s but they are a little on the small side if I wanted to wear anything thicker than a t-shirt underneath so I re-ordered size 12s and thankfully they're in stock and arrived shortly after. The material is a soft jersey which is so comfortable to wear. I still can't quite believe the price of these, they were £24.99 but went in the sale half price £12.99. The quality is amazing, nicely lined inside and very flattering on. Then I saw the blue stripey version and had to have it as well, I mean for the price I thought it would be silly not to! 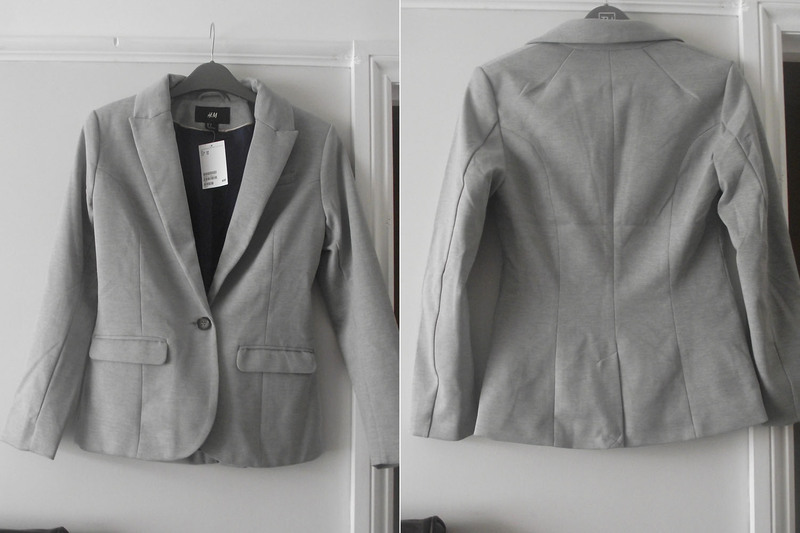 I know for sure these blazers will get lots of wear in the Autumn with scarves and plain tees and jeans. I've also been eyeing up the Zara mole satchel but thought seeings as every man and their dog seems to buying it I thought I would be different and when I saw this little cross over bag it reminded me of it- rose gold fastening and soft material. This only cost £7.49 in the sale which is a great price, this holds quite a lot of stuff in surprisingly, I can feel a What's in my handbag post coming up! I saw these a while ago in store and loved them, however I don't really need more bags but when they were half price in the sale I just HAD to have them lol. Makeup Bag- £1.99 Toiletry Bag- £3.99. I was in need of some belts and these come as a pair and only cost £3.99! Perfect. I find that the Tan ones are best because they go with most items/colours in my wardrobe. A wanted another everyday top I could just throw on with Jeans and something which looked half decent, for £3.99 there's nothing to criticise! I didn't realise until recently I have a slight obsession with stripes. I couldn't believe the price of these, hence 2 tops in different colour options. I love the chunky gold zip on the back of them, these look really nice on. I like the boat neck style and didn't have anything with this style cut, I love 3/4 length sleeves they're so practical with our deary British weather! Orignally £12.99 but reduced to £6.49. On both tops the stripes are actually gold thread which makes a nice change, really happy with these. Next up is this loose fitting purl-knit sparkly jumper, this is perfect for for now or early autumn. The 3/4 length sleeves make it wearable in the warmer weather but also if it's a little on the chilly side I can pop a vest top underneath. Or pop on a blazer or my denim jacket. I got this half price £24.99 £12.99. I bought these organic cotton canvas textile storage baskets, I liked the pretty blue floral print and how they looked online with their tops folded over. I'm hoping to sort out the top of my cabinet! Getting fed up with the mess. These where half price £7.99 £3.99. I don't think I will be buying any clothes or accessories anytime soon! I hope you enjoyed this post and let me know if you want to see any outfit posts. Fab haul :) H&M is a store that I always go into at least once whilst in town lol. I find their clothes very affordable, and of decent quality :). So so in love with those makeup bags! I still can't believe they are from H&M haha! Love the cosmetic bags & the navy/gold stripe top will me mine! I'm a stripe fan too - just got the loveliest jersey stripe maxi from DPs.